Rank- 6, DINESH KUMAR CSE 2016 who was our ILP-2016 student proudly shares his experience with IASbaba. When we met DINESH KUMAR, he had a brilliant story to tell! Nothing more than an amazing source of experience. Coming from a very humble background reaching to such height of success is nothing less than a miracle. Meeting his family was equally wonderful and the values of family reflected in the manner Dinesh invited us and shared his experience. People complain about lack of resources and dearth of quality guidance in the journey of UPSC preparation, Dinesh’s story is something to be cherished. What a humble and inspiring personality he is!! Indeed we need such hard working and down to earth people in our Administration. We are proud of you and happy to be associated with you. Examples like him give us strength and motivation to strive forward to achieve what we started our journey for – to provide quality education to aspirants in the remotest corner of India. She has also justified our moto i.e. “One stop destination for UPSC”. Dinesh sharing his experience and role of Integrated Learning Programme (ILP) in his success! Love the process than the Outcome. 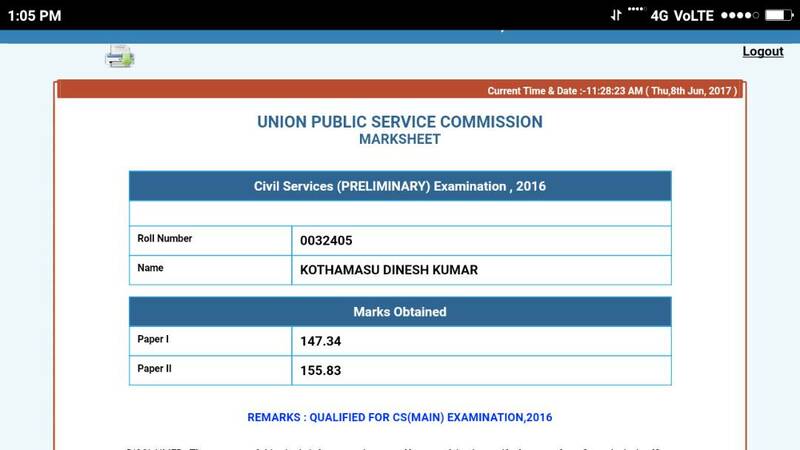 This is Dinesh Kumar, Secured All India Rank 6 in this Year CSE 2016. To be honest, even while I am writing this, it still feels like a dream, each and every second I pray to GOD, to not turn this into a dream. I still remember on the eventful day of May 31st, when I was waiting for the results I was considering all the possibilities (In the top 90, In the list and Out of list) with equal probability. Hence my only wish to GOD was, Please get me into the list. I can still recall, that when I opened the list along with my friends, I started searching my name from the bottom of the list (I don’t have the courage to use Crtl + F) only when I thought I did not make it to the list (as i was trying to see ranks below 50), my friends screamed RANK 6. We all started shouting loud, hugging each other like people gone mad. It was a moment when a long cherished dream looked coming to life all of a sudden. The result took so long to sink in, in fact even now I sometimes feel is it true ? After the initial excitement I looked at my best friend and we both said “Now it is the time to serve”. I don’t want to put the feelings in words because I strongly feel no matter what, Words cannot do justice to that moment. I am telling you all these because, I just want to convey by my example that even the topper of UPSC is no different from others, even he was not certain about his selection, carries the same emotions and feelings, faces turmoils both emotionally,physically & financially, has ups & downs, faces self doubt at times but guys this is all very normal in UPSC’s marathon preparation. I was also studying like you in the Basements of Old Rajinder Nagar or anywhere, and staying in highly inflated Flats of Delhi. In fact I can recollect, that when I was reading the success stories of many toppers, I always thought, will I be able to write my success story?. This can also be the same going through your minds now, but believe me and more so in yourself, you have all the capability, potential and ability to crack this exam and come out with flying colors. Below is my strategy for various subjects, and make few changes to your preparation if you think it is useful. Attached below are the screenshots of my Mains and Prelims scores. I am a Mechanical graduate from National Institute of Technology, Warangal. Later I worked as a Site Engineer in Bharat Petroleum Corporation Ltd for One Year, then I formally resigned to my job to focus on the preparation. I started full fledged preparation in July 2015, I took my coaching from Vajiram and Ravi(For my GS and Optional) and was able to clear this exam in my First Attempt. I participated in Interview Guidance Programme of GS Score, GS Mentors, KSG and Samkalp and IAS Baba. And I am frequent visitor to sites like IAS Baba and other online sources. Apart from this I am not related to any of the Coaching insitutes, which many are claiming so. Please spread the word. Believe in the process than in the outcome. I remember the day when I said to my father before starting my preparation, that even if I don’t become an IAS/IPS, I will be a much better person with greater amount of knowledge and confidence and more so a responsible citizen. I strongly believe that each and everyone of us can clear this exam. To be frank, my General Knowledge was so poor, that I did not know the capital cities of France and Italy at one point of my time. If I can make it to the list definitely you can. Hence Self confidence and believing yourself is very important in this exam. This exam is relative hence you need to play according to your strengths. Essay was not my strength and added to it I did a mistake of not practicing it much. If you observe I got very less marks in my Essay Paper, but even before the result was out, I was expecting around 120-130 because I wrote a very very general Essay and did not take risk to score high 140’s. All I wanted was that my Essay should not pull my rank down. Hence knowing your weaknesses and working on it is very important in this exam. You need to make sure that your weakness wont cost you much. Many a times we study many irrelevant topics or articles, to overcome this we need to have syllabus strongly in our mind to differentiate which all are important to save time. For example, take any text book like Bipan Chandra, you would be having one or two important points in the whole page, rest is just supporting part to develop the context, hence while reading you should directly pick that important point and leave the rest. This way you can read fast. And believe me this can be easily developed with practice. But you should be conscious enough while reading on how to cut some time. You need to make innovations in your answer writing to get that additional mark which differentiates you among others. To do this you should start picking up some Flowcharts, diagrams, graphs etc in the government reports or in your textbooks. Maintain a data base of all these and try to replicate this in the Mains examination. This I did more so for my optional, You study one extra scholar for every topic and one extra point for each scholar to make your answer standout. It would not take much time to do this, you just need to Google and study about them for 30 Minutes. Modern History : Spectrum and for Mains I studied Bipan Chandra too. Science and Technology : I did not study any specific book, I just followed current affairs. IASBABA value Addition notes provided during my ILP(I was one of the member of their ILP programme) was very useful in getting few additional points and to have a quick revision. For prelims, I followed Online quiz initiatives of IAS BABA and other online initiatives everyday. Apart from it as a part of ILP I also wrote the tests conducted by IASBABA and studied according to the plan given by them. And for all the topics, Vajiram and Ravi class Notes formed by basic foundation. Optional Sources : (Political Science and International Relations): Shubhra Madam Notes to get clarity and basics right. Western Political Though by Sushila Ramaswamy. Indian Political Thought by VR Mehta. I studies Indian BL Fadia for Section B(Paper I), I did not found useful. Rather than it I would suggest you to read ARC reports and Punchhi and Sarkaria Commission reports. Dont miss on easy topics like Planning and Economic Development, Land reforms, Agraraian relations. They are scoring and very easy. I also studied IGNOU books for all these topics, they are very helpful in making your concepts very clear. I also studied Oxford Indian Foreign Policy – But I did not find useful, you can use these scholar names. Rather than it I would suggest to watch RSTV debates. Followed Distinguished lectures of the Ministry of External Affairs. Do follow it, one of the best source to get good points. 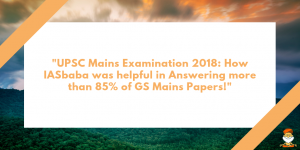 This was just a brief writeup, and very soon I would share all my notes and my Answer scripts and an elaborated strategy on how to write some good answers in GS and Optional. I will make it As soon As Possible. Hope this Helps to some extent. Please feel free to contact me. (My email id :upscdoubts@gmail.com). Last but not the least, since Prelims is over, don’t think more about cutoff’s rather start preparing for Mains, because every day is important from now on. Keep Working hard till your goal is attained. And remember that UPSC is not an end for us, Life is much greater than UPSC. Enjoy the process, it will automatically take care of the outcome. There are many aspirants who could not clear it in their initial attempts, but they clinged on – they kept their routine on, kept giving their best & results did come their way gradually. UPSC has unpredictability, it is a great equalizer just keep giving your best. TRY TO WIN EVERY SINGLE DAY at a time.